The forelimb-specific gene tbx5 is highly conserved and essential for the development of forelimbs in zebrafish, mice, and humans. Amongst birds, a single order, Dinornithiformes, comprising the extinct wingless moa of New Zealand, are unique in having no skeletal evidence of forelimb-like structures. To determine the sequence of tbx5 in moa, we used a range of PCR-based techniques on ancient DNA to retrieve all nine tbx5 exons and splice sites from the giant moa, Dinornis. Moa Tbx5 is identical to chicken Tbx5 in being able to activate the downstream promotors of fgf10 and ANF. In addition we show that missexpression of moa tbx5 in the hindlimb of chicken embryos results in the formation of forelimb features, suggesting that Tbx5 was fully functional in wingless moa. 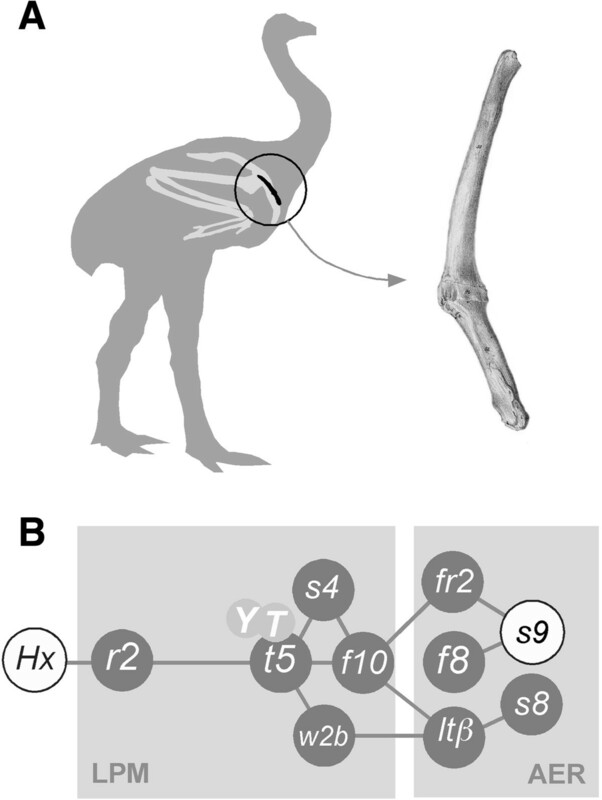 An alternatively spliced exon 1 for tbx5 that is expressed specifically in the forelimb region was shown to be almost identical between moa and ostrich, suggesting that, as well as being fully functional, tbx5 is likely to have been expressed normally in moa since divergence from their flighted ancestors, approximately 60 mya. The results suggests that, as in mice, moa tbx5 is necessary for the induction of forelimbs, but is not sufficient for their outgrowth. Moa Tbx5 may have played an important role in the development of moa’s remnant forelimb girdle, and may be required for the formation of this structure. Our results further show that genetic changes affecting genes other than tbx5 must be responsible for the complete loss of forelimbs in moa. Limb loss by regressive evolution is common in nature with well-known examples being whales, some salamanders, and snakes. Amongst birds, the loss of forelimbs is best represented amongst ratites, with a general reduction in wing size evident in the rhea and ostrich, and a more severe truncation of wings shown in emu, cassowary, kiwi, and elephant bird. Surprisingly, phylogenetically, New Zealand’s moa group with the fully winged and flighted tinamou , despite having lost almost all skeletal elements associated with the wing. The only evidence that moa once had wings is the presence of a small finger-sized bone, the scapulocoracoid, a fused remnant of the forelimb girdle’s coracoid and scapula (Figure 1A, B). Moa forelimb structure and forelimb initiation gene network. A. The moa wing skeleture consists of a small finger-sized bone that represents the fusion of remnants of the coracoid and scapula to form the scapulocoracoid (right). A fully developed wing skeleton (light grey) is shown superimposed onto a moa sillouette for comparison. The scapulocoracoid is circled and shown in black. B. The central gene network essential for forelimb initiation. A Hox expression code initiates the expression of retinaldehyde dehydrogenase 2 (r2) and tbx5 (t5) in the lateral plate mesoderm (LPM) . Tbx5, in combination with YAP and TAZ (Y, T; ), interacts with Sall4 (s4)  to activate fgf10 (f10) and subsequently fgf8 (f8) in the limb apical ectodermal ridge (AER). An additional activator of forelimb initiation Wnt2b (W2b) possibly acts upstream of, or in conjunction with tbx5 through the transcription activators LEF/TCF and beta-catenin (ltβ) [3, 51]. To determine the molecular basis of winglessness in moa, we present the first reconstruction and characterization of an ancient multi-exon gene, tbx5, a highly conserved Tbox motif-containing transcription factor known to be essential for forelimb initiation in nearly all animals. Tbx5 is an essential member of a tightly regulated gene network that includes the Hox genes (reviewed in ), fgf8, fgf10[4–6], ANF , and sall4. Of these, tbx5 is perhaps the best characterized [5, 6, 8–10]. Knockouts of tbx5 in mice, or morpholino-induced tbx5 knockdowns in zebrafish, result in the complete loss of forelimbs [11, 12]. Similarly, natural occurrences of limblessness in humans and zebrafish have been attributed to mutations in tbx5. In humans, most tbx5 mutations are found in the highly conserved DNA-binding Tbox region and result in Holt-Oram syndrome (HOS), characterized by reduction of the forelimbs and associated heart anomalies . A similar phenotype is shown by the zebrafish tbx5 mutant heartstrings. The spectrum of mutations in Tbx5 that contribute to Holt-Oram syndrome continues to grow [9, 14, 15]. Tbx5 mutations have now been found in more than 70% of patients with a strict clinical diagnosis of HOS . Interestingly, a number of Tbx5 coding sequence mutations result in relatively mild heart defects but severe forelimb abnormalities [14, 17, 18]. As the forelimb phenotypes of mouse tbx5 knockouts very closely resemble the phenotype seen in moa, we reconstruct, build, and characterize moa tbx5 to determine the molecular basis of winglessness in this extinct ratite. To amplify moa tbx5 sequences, primers were designed to chicken tbx5 (NM_204173.1) and ostrich and kiwi tbx5 mRNA. To obtain the intron/exon boundaries we first obtained these for kiwi using a range of PCR-based methods and then designed primers to these to amplify from moa (Additional file 1: Figures S1-2). Nearly all kiwi tbx5 intron primers successfully amplified from moa aDNA. For a few intron/exon boundaries additional sequence was required from emu, cassowary, ostrich and/or rhea (Figure 2). Moa tbx5 sequences were obtained as ~120 bp overlapping fragments from a number of species either by direct sequencing of PCR products or cloned material (Figure 2) (Additional file 1: Figures S3-5, S8). A complete sequence was obtained for the giant moa Dinornis with additional sequence across the highly variable regions of exon 2, exon 6, and exon 8 also being obtained from Megalapteryx didinus (OM Av10049). A single interspecies polymorphic position (G > C) was detected between Dinornis and M. didinus at the third base position in coding triplet 18 (Additional file 1: Figure S4). A number of additional sequence variations were detected between moa sequences, but nearly all of these were from clones and were C > T transitions commonly the result of aDNA damage. No clear heterozygosity was found amongst moa tbx5 sequences suggesting the absence of a psuedogene (Additional file 1: Figures S4-5). Moa tbx5 is 521 amino acids long and is identical for the essential 183 aa DNA-binding Tbox region to that of chicken, ostrich, and kiwi. Only two amino acids are unique to moa; an Aspartic acid (D) > Glutamic acid (E) change at amino acid position 3 and a Threonine (T) > Serine (S) change at amino acid position 4 (Additional file 1: Figures S6-7). To verify that these amino acid changes were present on the same molecule, ‘long’ aDNA amplications were performed to include all the variation detected in exon 2. Intron - exon boundaries of moa tbx5 all harboured the consensus GT (donor)-AG (acceptor) splice site sequences (Additional file 1: Figure S8). A single intervening sequence change from the consensus G to A at position 5 (IVS2 + 5G > A) in Dinornis tbx5 intron 2 has been shown to result in the human fibrinogen gamma gene (FGG) in either retention of the affected intron in the mRNA  or deletion of the preceding exon . This sequence change however, is unlikely to have an effect on moa, as this splice site is highly conserved with that from tinamou. 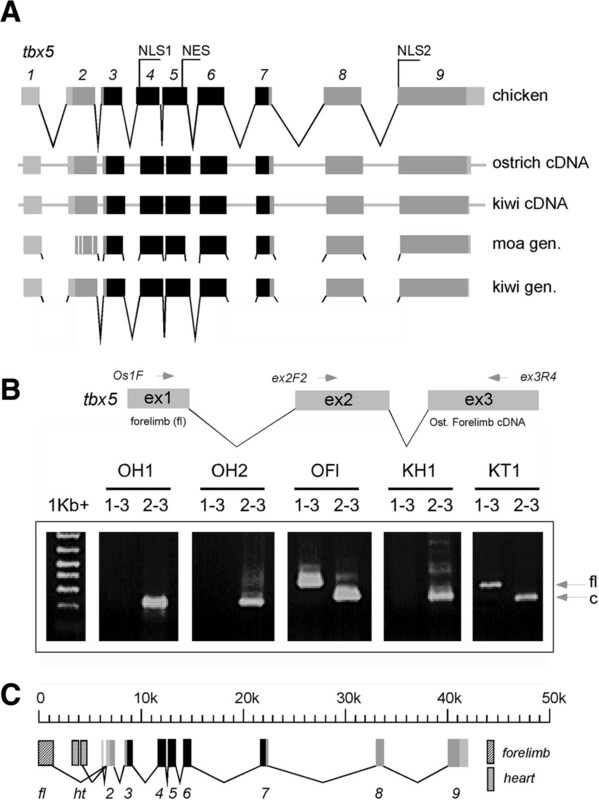 Gene structure of moa tbx5 and detection of forelmb-specific tbx5 transcripts in ostrich and kiwi. A. Comparison of moa tbx5 gene structure with those of chicken, ostrich, and kiwi. Moa tbx5 exons were identical in length to those of chicken and kiwi. Complete genome data for ostrich was not obtained. The coding region is shown in grey and is 521 amino acids long for all transcripts shown. The 183 amino acid Tbox region is shown in black and is identical between chicken, kiwi, ostrich, and moa. The four amino acids unique to moa Tbx5 at the NH2 terminus are shown by white vertical lines. The position of Nuclear Localisation Signals 1 and 2 (NLS1, NLS2) and the Nuclear Export Signal (NES) are shown [52, 53]. B. A primer (OsF1) designed to tbx5 exon1 sequences obtained from ostrich forelimb cDNA by 5’ RACE was used to try and amplify tbx5 transcripts from heart and forelimb cDNA. Primers to exon 2 and exon 3 amplified the correct sized product from both tissues while the exon1 primer amplified transcripts from forelimb only. OH - ostrich heart cDNA, OFl - ostrich forelimb cDNA, KH - kiwi heart cDNA, KT - kiwi tissue cDNA. C. 5’ RACE analysis of A-tailed ostrich heart and forelimb transcripts identified forelimb and heart specific exons. Cross-hatched boxes represent exons expressed in forelimb only. Diagonally lined boxes are exons expressed in heart only. Primer walking of the chicken genome was used to determine the exon boundaries for kiwi and ostrich heart and forelimb tbx5 cDNA. Several clones were sequenced and compared with sequences upstream of chicken tbx5. Two heart-specific exons were located and a single forelimb exon. Analysis of chicken sequences directly upstream of these exons detected no obvious promoter-like sequences. Moa or chicken tbx5 in pCAGGS was co-transfected into HEK293T cells with fgf10 or ANF promoter-luciferase constructs and assayed for luciferase activity. Both chicken and moa Tbx5 were able to activate the ANF and fgf10 promoters with equal efficiency (Figure 3). Luciferase assay for mouse fgf10 and ANF promoters. Both chicken and moa Tbx5 activate the fgf10 and ANF promoters in a similar dose dependent manner. 1x, 2x and 10x amounts of vectors containing chicken and moa tbx5 were transfected into HEK293T cells with fgf10 and ANF-luciferase promoter constructs, and luciferase activity was measured. Both chicken and moa tbx5 were equally effective in the activation of fgf10 and ANF promoter elements. Electroporation of an RCAS moa tbx5 construct into the presumptive hindlimb region of chicken embryos resulted in the hindlimb developing of a number of forelimb features, including reduced talon size, the production of feathers, and the phenotypic conversion of a hindlimb digit to one that more closely resembles a digit found in the wing (Figure 4, Table 1). Phenotype changes in RCAS moa tbx5 chick embryos. Hamburger Hamilton (HH) stage 14 chick embryos were injected in the presumptive hindlimb region with RCAS moa tbx5 and subjected to electroporation. Embryos were harvested at HH stage 40 and stained with Victoria blue. Control HH stage 40 wing and leg are shown. Digits from Victoria blue stained control limbs are numbered. Feather growth in RCAS moa tbx5 electroporated chick embryo hindlimbs is shown by the orange arrow heads. Victoria blue stained RCAS moa tbx5 hindlimbs show a wing-like digit pattern with talon reduction (red arrow heads) and conversion of hindlimb digit 4 to wing-type digit 3 (black arrow head). Complementary DNAs from ostrich and kiwi heart and forelimb, respectively, were A-tailed and 5’ nested RACE was carried out to isolate tbx5 exon 1 sequences (Additional file 1: Figure S9). Primers designed to exon 1 sequences obtained from forelimb tbx5 only amplified from ostrich or kiwi forelimb RNA (Figure 2). Primer walking using the chicken genome allowed the isolation of ~350 bp of forelimb-specific exon 1. Isolation of this sequence from emu, cassowary, kiwi, ostrich, rhea, tinamou, and moa shows very little difference between the ratites, with only 4.7% difference shown between moa and rhea, thought to have diverged approximately 80 mya (Additional file 1: Figures S10-12; ). Loss of flight is common in birds . Studies on Pacific Island rails show that flightlessness can occur rapidly with some birds becoming large and flightless within three million years . For ratites however, it is unknown how long it took for each species to lose flight capabilities. It has been proposed that all lost their flight independently during the Cretaceous Tertiary (KT) boundary approximately 65 mya , a theory that challenges the vicariance biogeography model where flightless ratites are presumed to have ‘rafted’ apart with the breakup of Gondwana . Unlike the other ratites, moa have lost all elements of the forelimb skeleton, save for a finger-like bone, the scapulocoracoid, that once was part of the forelimb girdle. The scapulocoracoid consists of a short coracoid and a long tapering scapula. It is more easily identified in Dinornis, Anomalopteryx, and Pachyornis, but was very small due to the loss of the coracoidal fossa in Megalapteryx, Euryapteryx, and Emeus. Moa do not have a glenoid fossa for articulation to the humerus . The timing of forelimb loss in moa is difficult to determine as a result of limited fossil material. However, by applying mutation rates to phylogenies constructed from Holocene moa, it has been suggested that the last common ancestor of Holocene moa lived 5.8-18.5 mya [25, 26]. Furthermore, the discovery of moa leg bones 16–19 mya that are morphologically very similar to those from the Holocene, suggests that these moa were very similar to their later relatives and were also likely to be wingless at that time . As the tinamou/moa split is thought to have occurred 60 mya , this places the time taken for moa to develop winglessness at approximately 40 mya. Although by no means conclusive, it is worth noting that a fossil toe bone of Late Cretaceous age (80–65 mya) from New Zealand’s North Island may possibly be from a very large bird . Flightlessness and forelimb loss is thought to occur by gradual deminishment as a result of changes in expression of a number of select genes. However, high conservation between the tinamou and moa forelimb-specific exon 1 suggests that in moa tbx5 continues to be expressed in the forelimb region despite possibly 16–19 mys of winglessness. Due to the complex nature of limb development, it has been proposed that limbs can be lost but not regained [29–31]. Collin and Cipriani (2003)  go on to suggest that unused genes remain in a functional state in genome for ~6 my but are almost certain to lose their function at about 10 my. This proposal has been challenged by studies on squamates where it has been shown that lost digits at least are recoverable through evolutionary time [33–35]. One reason for this may be that the pleiotropic nature of some genes may act to keep them functional . For example, avian teeth were lost 70–80 million years ago, but the avian genome still harbours the genes required for tooth formation and birds are still able to do so, as has been shown by the recovery of crocodilian-like teeth in mutant talpid 2 chickens . Similarly, despite having been eyeless for over 1 million years, crosses between different eyeless cavefish populations have been shown to restore vision suggesting that even for complex structures such as eyes, very few loci are required for their redevelopment . The reasons for forelimb-specific expression of tbx5 in moa are unclear, but may suggest a role for Tbx5 in maintaining the scapulocoracoid. In flighted birds the scapulocoracoid is always separated into a coracoid and scapula that collectively function to operate flight muscles important for the wing’s downward stroke. The retention of a remnant of this structure in moa for so long may well suggest that in moa the scapulocoracoid has evolved a new function. Our results support observations made in mice showing that Tbx5 is necessary for the induction of forelimbs but not sufficient for continued forelimb development [39, 40]. A ~7 day post-fertilization kiwi embryo and kiwi embryonic heart were kindly made available to us by Dr. Suzanne Bassett, Otago University, New Zealand. Fertilized ostrich eggs were obtained from Kadesh Ltd, Tajo Ostrich Centre, Kumeu, Auckland, New Zealand, and incubated at 37°C with alternate clockwise/anticlockwise 180° rotations every 12 hours. Ostrich eggs were backlit to measure air-cell size reduction during embryonic growth and embryos were harvested after two weeks. (corresponding to approximate Hamburger Hamilton stage 38, (HH38; [43, 44]) when most organ and limb building events are taking place). Emu, rhea, ostrich, and cassowary DNAs were a kind gift from Dr Joy Halverson, Zoogen Services, Sacramento, California, US. Kiwi blood was provided by Dr Murray Potter, Massey University, Palmerston North, New Zealand. Bone samples, kindly provided by the Otago Museum, the Auckland Institute and Museum, Canterbury Museum, and Massey University, were obtained for D. novaezealandiae, D. robustus, E. curtus, E. crassus, and M. didinus (see Additional file 1: Table S1). All animal work was conducted according to relevant national and international guidelines. In particular, chick embryo work followed guidelines for animal work enforced by Nagoya University. Chicken embryos were sacrificed at HH stage 40. For the ostrich embryo work, given the early stage of sacrifice, no ethics approval was required. All waste material, including chicks, chick eggshell, and yolks were autoclaved and disposed of as industrial waste. Total RNA was isolated from approximately 100 mg of proximal forelimb or heart tissue using TRIzol® (Invitrogen) according to the manufacturers instructions. Genomic DNA was recovered from extant ratite blood by standard phenol/chloroform extraction and ethanol precipitation . Ancient DNA (aDNA) was extracted from about 50 mg of moa bone shavings by incubation with rotation overnight at 56°C in 0.5 M EDTA/0.01% Triton X100 with ~2 mg of proteinase K. The mix was then extracted with phenol:chloroform and chloroform and the acqueous layer was purified using a Qiagen Dneasy® Blood and Tissue Kit. The silica bound aDNA was eluted with ~40 ul of 0.01% Triton X100 and stored at -20°C. Approximately 5 ug of total RNA was reverse transcribed at 41°C for 60 min in 20 ul volumes with random 7-mer or oligodT primers and purified by phenol:chloroform extraction and ethanol precipitation. DNA was amplified from approximately 1–20 ng of DNA as outlined in . A number of PCR-based methods were used to obtain the kiwi tbx5 intron/exon boundaries required to allow primer design for moa amplification. These included: Single primer PCR - A single primer was used in a standard PCR reaction at low annealing temperatures for one cycle to allow random priming and then amplified for ~35 cycles with the annealing temperature set at the primer’s Tm. Hairpin primer ligation PCR - hairpin primers containg a PstI compatible overhang were ligated to PstI-digested DNA before standard PCRs were carried out using the hairpin primer and a tbx5-specific primer. Medium range PCR - amplification across the smaller tbx5 introns was carried out usng Elongase® (Invitrogen) or Expand Long Template PCR System (Roche) as outlined by the manufacturer. Inverse PCR - Inverse PCR was carried out to obtain intron sequences directly from moa. Biefly, moa aDNA was denatured, then dephosphorylated with shrimp alkaline phosphatase (SAP) before fresh phosphates were added with T4 Polynucleotide Kinase. The aDNA was then circularised with CircligaseTM ssDNA Ligase (Epicentre®) and subjected to rolling circle amplification using TemplifyTM (Amersham). The amplified aDNA was then subjected to standard PCR using inverse primers. To isolate moa tbx5 sequences we initially obtained full-length tbx5 cDNA sequences for kiwi and ostrich. Comparison with the chicken genome identified the intron/exon boundaries and primers were then designed to recover moa tbx5 exon sequences. To obtain moa tbx5 intron/exon boundaries, these boundaries were first isolated from kiwi. Primers were then designed to kiwi tbx5 intron sequences and conserved ostrich/kiwi/chicken tbx5 exon sequences to obtain moa tbx5 intron/exon boundary sequences. Most primers designed to kiwi tbx5 intron sequences successfully amplified from moa aDNA. For a few introns however, primers successful for amplification from moa required additional intron sequences from rhea, and/or ostrich. Total RNA isolated from embryonic ostrich and kiwi forelimb and kiwi heart were A-tailed with terminal transferase (Invitrogen) and amplified with H5FdT (5’- AATCGGACAAACTGGTCCTTGCAACdT20) and ex2R2 (5’- GGTGAGCGACTTGCTGGTG), followed by H5F (5’- AATCGGACAAACTGGTCCTTGCAAC) and ex2R3 (5’- CAAAGCCTTCCTCCGTAT). Amplified products were TA cloned into pGEM®T-Easy (Promega) and sequenced with m13F (5’-TGTAAAACGACGGCCAGT) or m13R (5’-CAGGAAACAGCTATGACC). Full-length forelimb-specific exon 1 transcripts were then obtained by cDNA walking using primers designed to conserved upstream regions of the chicken genome. PCR products were purified by centrifugation through dry Sephacryl S200HR, sequenced using ABI BigDye® Terminator v3.1 chemistry, then analysed and aligned in SequencherTM 5.0 (Gene Codes Corporation). In accordance with criteria suggested for the verification of aDNA sequences , a number of samples were extracted and sequenced at a separate ancient DNA facility at Massey University, Auckland, New Zealand. 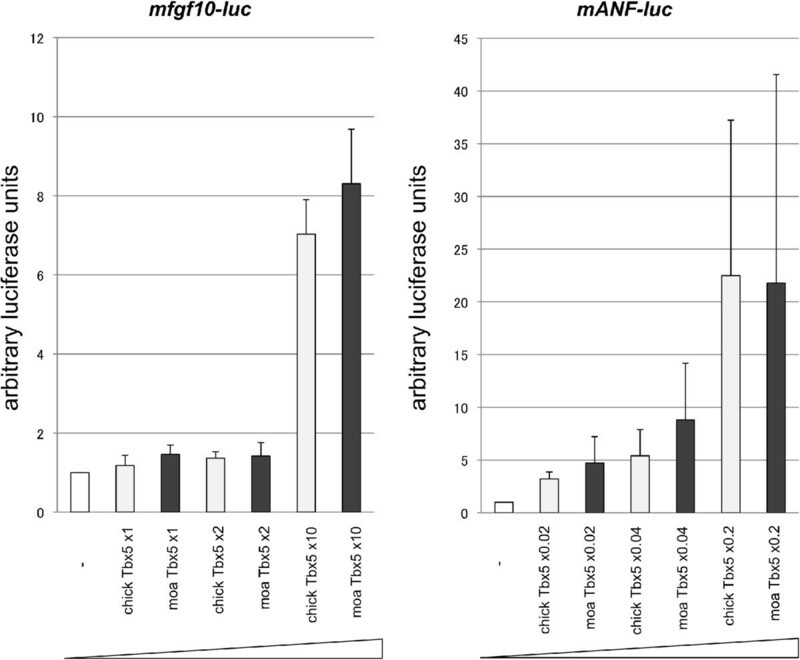 The ability of moa Tbx5 to bind to and activate downstream fgf10 and ANF promoters was determined using a luciferase assay. HEK293T cells were seeded into 24-well plates at a density of 5 × 104 cells/well twenty four hours before transfection. The following vectors were transfected into HEK293T cells using XtremeGENE HP (Roche); 6 kb of mouse sequence immediately upstream of fgf10, or 0.7 kb of mouse sequence immediately upstream of the ANF promoter , both fused to luciferase, pCAGGS containing chick or moa tbx5, CMX-β-galactosidase, and an empty control vector (pcDNA3.1). Forty-eight hours after transfection, the cells were lysed, and luciferase activity was measured using a Luminescencer-JNR (ATTO). β-galactosidase activities were measured to standardize the efficiency of transfection. Results are expressed as the average of three samples including standard deviation. Electroporation into the chick hindlimb field was carried out as described previously . Briefly, 2 ug/ml of RCAS-moa tbx5 plasmid was injected into the prospective hindlimb field at Hamburger Hamilton (HH) stage 14 by glass capillary. Electric pulses (8 V, 60 ms pulse-on, 50 ms pulse-off, three repetitions) were applied using an CUY21-EDIT electroporator (NAPA GENE) with platinum electrodes. Electroporated embryos were harvested at HH stage 40 and stained with Victoria blue. Victoria blue staining was carried out as described in . Supporting tables and figure are available as additional files. Tbx5 sequences are deposited in NCBI’s GenBank [GenBank Acc Nos. KJ584152-KJ584161]. Grateful thanks to Paul Scofield (Canterbury Museum) and Brian Gill (Auckland Museum) for assistance. Thanks to Tim Heupink for helpful comments. This work was carried out with support from the Australian Research Council (Grant number DP110101364; The molecular evolution of wings in ratites). LH, TS, TO, YW, and SM carried out the molecular genetic studies. LH, DML, CDM, CS, and MH helped conceive the study and participated in its design and coordination, and helped to draft the manuscript. All authors read and approved the final manuscript.